Robert Beckford's 'Jesus Dub: theology, music and social change' (London: Routledge, 2006) offers a 'dialogue between the cultural production of dancehall and theology of the church hall', drawing on his own experiences in African Caribbean Christianity and of sound system culture. 'What immediately struck me when I entered the converted class-room masquerading as an urban dance floor was the sheer intensity of the event. It was corked full of young people and the events were conducted in pitch dark. It was also boiling hot due in part to the reggae dance floor chic of wearing winter coats with matching headwear. 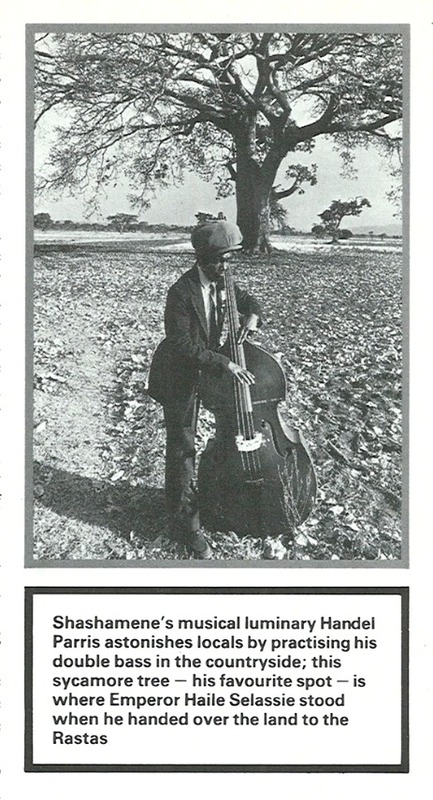 However, overpowering all of my senses was what Julian Henriques terms sonic dominance of the sound system. There was a throbbing, pulsing bass line ricocheting through the bricks, mortar, flesh and bones. The sonic power was tamed in part by the DJ's improvised poetic narration or 'toasting' over the dub track. 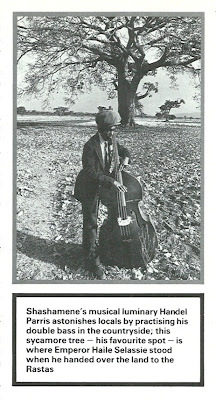 Playing on the turntable was a dub version of MPLA by a reggae artist called 'Tappa Zukie' (David Sinclair). As the DJ 'toasted', the silhouetted bodies moved in unison to the bass line: the heat, darkness and body sweat adding to the sheer pleasure of this Black teen spirit... These rituals of orality, physicality and communality were also acts of pleasure and healing'. Beckford is also good on the sound systems as means of cultural production: 'Sound systems consist of far more than just turntables and speakers. Such is their size and complexity that they require a crew of people to run them' (operators, selectors, DJs, drivers etc), and 'this is an important point of departure from the current trend in mainstream popular DJ culture where DJs travel with records and play on sets already pre-prepared and with which they have no relationship... As well as being a community, the sound sysyem's division of labour provides an opportunity for artistic development'. If the theological aspects of the book sound like a turn-off I recommend sticking with it. Beckford attempts the ambitious task of 'dubbing' pentecostalist Christianity with a bit of help from 'Black liberation theologies of the Black Atlantic' (James H Cone, Gutierrez etc.) as well as Paul Gilroy, Deleuze and Guattari. If you think it's stretching it a bit to describe Jesus as 'a dubbist involved in taking apart and reconstructing. human life and transforming unjust social structures and practices', you should at least be open to having some of your prejudices challenged. It certainly gave me pause for thought and made me a bit more sceptical of the assumption that proliferating black churches are simply a sign of political quietism if not reaction, even more so of the assumption that the leisure choices of white middle class urbanites (arthouse cinemas, restaurants) should always be given precedence*. 'But, the comfort was, that all the company at the grand hotel of Monseigneur were perfectly dressed. If the Day of Judgment had only been ascertained to be a dress day, everybody there would have been eternally correct. Such frizzling and powdering and sticking up of hair, such delicate complexions artificially preserved and mended, such gallant swords to look at, and such delicate honour to the sense of smell, would surely keep anything going, for ever and ever. The exquisite gentlemen of the finest breeding wore little pendent trinkets that chinked as they languidly moved; these golden fetters rang like precious little bells; and what with that ringing, and with the rustle of silk and brocade and fine linen, there was a flutter in the air that fanned Saint Antoine and his devouring hunger far away. Dickens is spot on on dress and class ('keeping all things in their places'), and on power as performance - even the executioner has to wear a costume. But there is also something about the English puritan radical tradition which I find uncomfortable - the act of dressing up is equated with decadence (and femininity) against which the soberly dressed plebeian must struggle. As an advocate of proletarian dandyism, I say the working class too has the right to the 'frizzling and powdering and sticking up of hair'! The state and media's targeting of social media following last week's riots in England started out as an absurdity, with twitter, facebook and blackberry messaging variously blamed for the ability of rioters to seemingly outwit the police. Now it has begun to take a tragic turn with the jailing for four years of two young men for posting up facebook events for riots that never even happened. They were prosecuted under sections 44 and 46 of the Serious Crime Act for 'intentionally encouraging another to assist the commission of an indictable offence'. Doubtless people did use their smartphones and their laptops to keep track with what was going on, arrange to meet up and spread information both true and false. But of course as many people have pointed out, riots have been happening for hundreds of years without the aid of these devices as insurgents have always found ways to communicate with each other. In the past , riotous demonstrations were sometimes publicised by chalked messages - see example from Deptford in 1932 . Thirty years ago there was a suggetion that Citizen's Band (CB) radio was being used by rioters. In the aftermath of the rioting in Moss Side, Manchester in July 1981 Chief Constable James Anderton blamed the events on a conspiracy: 'It was well-coordinated. We believe a kind of military strategy was used with look-outs, people taking up observations, and vehicles being used by spotters. We also know that CB radio was used to pass messages'(Times July 10 1981). CB radio enabled personal two way communication between users years before the mobile phone. By 1981 at least 300,000 people were believed to be using it in the UK, but it was illegal to do so amidst claims that it could interfere with emergency services communications (Times 27 February 1981). To demonstrate how law abiding they were, some CB users campaigning for legaliszation offered to help Manchester police by jamming rioters' messages (Times 11 July 1981), though their offer was rejected. Later that year, the Government did allow some FM frequencies to be dedicated to CB users, effecitively legalising it - though it remained illegal on AM. In real terms, CB radio was marginal in the 1981 riots but its advent did signal that the state's monopoly on this kind of communication was coming to an end. The police still do have a tactical advantage in communications, particularly through its network of CCTV, helicopter and satellite imagery. But the means of mass communication are no longer solely in its control. We can expect to see a concerted attempt to reverse this in coming months, with arguments being made to close down communications in 'emergency' situations. This will have implications for people trying to organise parties and all kinds of social events, not just demonstrations and riots. Last week a 20 year old from Essex was charged with "encouraging or assisting in the commission of an offence" under the 2007 Serious Crime Act. His alleged crime was publicising a mass water fight on Blackberry and Facebook. The similarities are obvious, a pervading sense of a post-colonial melancholia (Gilroy), dreaming of some imagined homogenous England free of social conflict that never existed. The choice of England as the frame of reference rather than the UK was particularly significant in 1981 since elsewhere in the disunited Kingdom - in the north of Ireland - scenes of rioting and urban violence had been commonplace for more than 10 years. The implicit assumption was that the 'heartland' should be kept untainted while its forces unleashed water cannons, CS gas, plastic bullets and indeed live ammunition in Derry and Belfast. If the imagined English rose garden is an acardia, any disruption must be borne by foreign bodies. There is a direct line from Margaret Thatcher's infamous 1978 comments about being 'swamped by an alien culture' to royalist historian David Starkey's complaint this week about the riots being partially the result of white youths 'becoming black'. 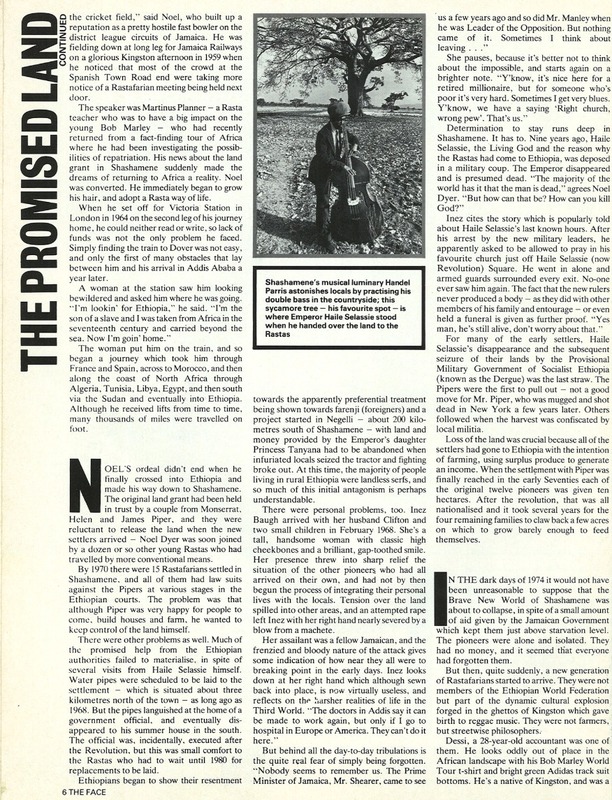 Inevitably, others have specifically pointed the finger at black music, with Paul Routledge in the Daily Mirror blaming 'the pernicious culture of hatred around rap music, which glorifies violence and loathing of authority (especially the police but including parents), exalts trashy materialism and raves about drugs'. But there have been changes. 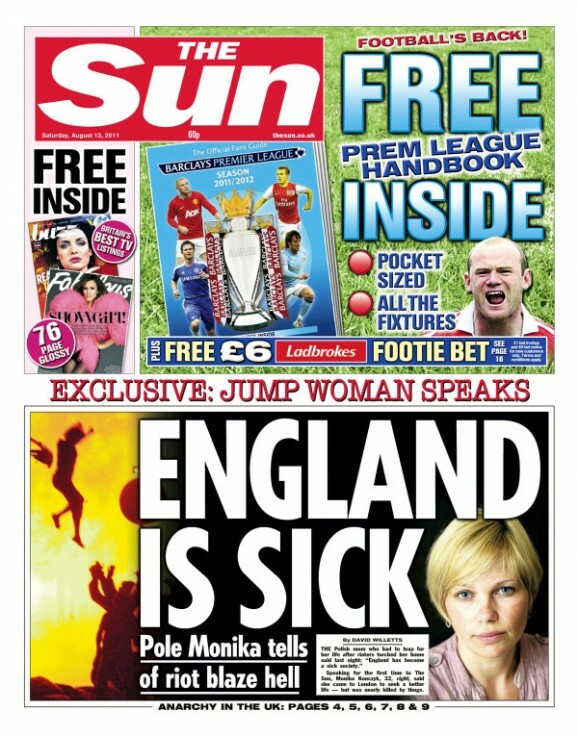 The woman on the front page of the Sun in 2011 is a Polish migrant rescued from a burning building in Croydon. England is more diverse than ever, and the dream/nightmare of an all-white Anglo-Saxon nation has receded into the past. Even the fascists like the BNP have stopped publically talking about forced repatriation and have opted instead for positioning themselves as a pressure group for white ethnicity - a begrudging acceptance, whether they admit it or not, of multicultural reality. Darcus Howe saw the 1981 riots as one factor leading to an 'ease of presence' for black people. Well it hasn't always been easy, but up until the 1970s, a significant proportion of white people believed that it was both desirable and possible to 'send 'em all back'. That England is thankfully dead, however much racism continues to exist in various forms. Still the Polish woman leaping from her flat, the Asian families mourning those killed in Birmingham, the black women at my work complaining about the unruly youth, also pose a problem for any future 'left' or 'radical' movement. The problem is not so much how to overcome cultural barriers but the difference between the rage of those who feel they have nothing to lose, and other working class people who feel - and sometimes are - threatened by this anger. 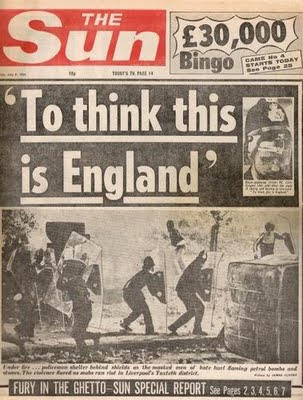 A working class consituency of all ethnicities that can be mobilised by papers like The Sun behind calls for more police and harsher sentences. A New England where overt official racism is marginalised, but marginalised young people - and especially young black people - have a tougher time than ever. The news today from Ethiopia is grim, as it has been at many times in the past, with drought, food shortages, torture and political repression. Yet this place has also been the focus of utopian hopes, not least from the Rastafarian movement. 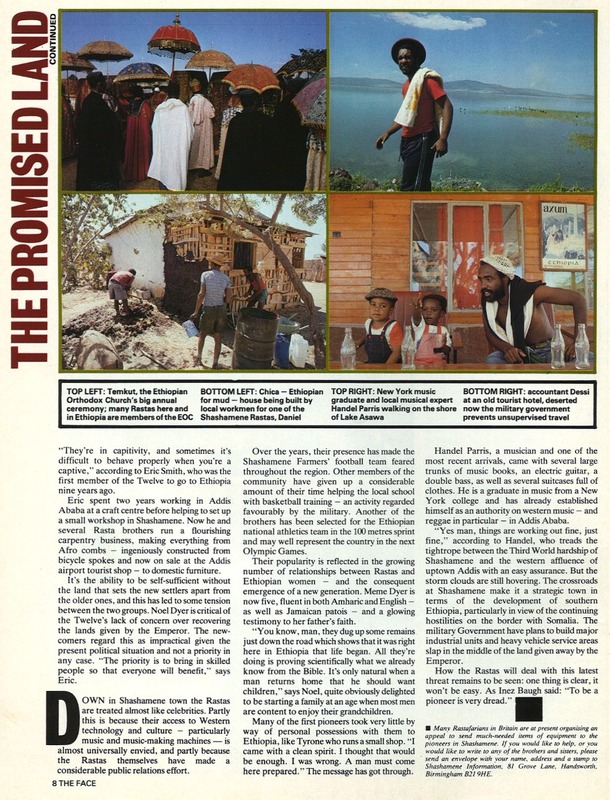 The Face magazine (November 1982) featured a fascinating article by Derek Bishton about Shashamene, a township in southern Ethiopia where Rastafarians from Jamaica and elsewhere had settled in search of a better life. 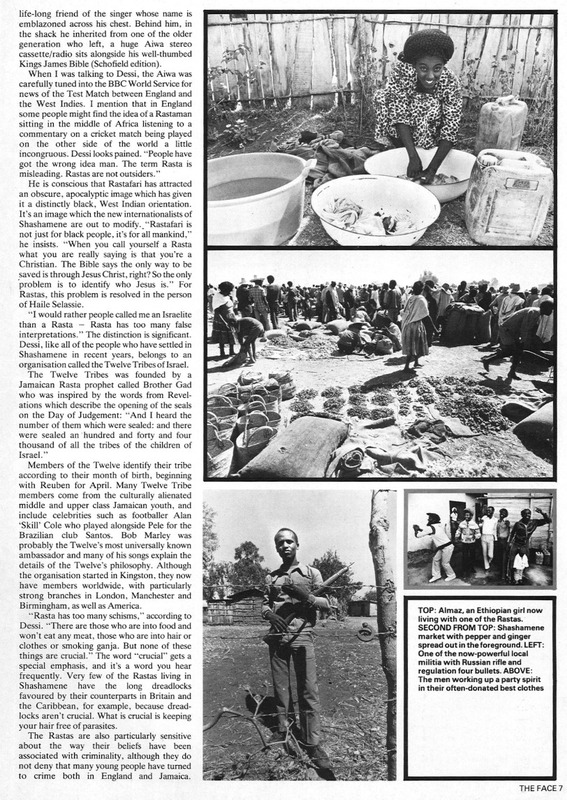 As the article explains, the origin of the setlement was the 1945 Land Grant, whereby Ethiopian head of state Haile Selassie donated 500 acres of land to enable black people from elsewhere to return to Africa. 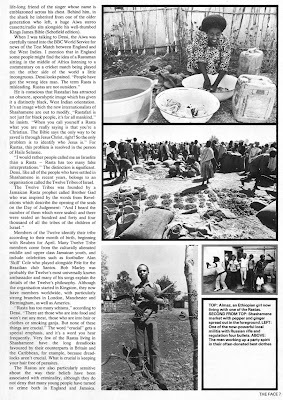 This had followed discussions with the Ethiopian World Federation, a Garveyite organisation set up to support Ethiopia after it was invaded by Mussolini's Italy in 1935. 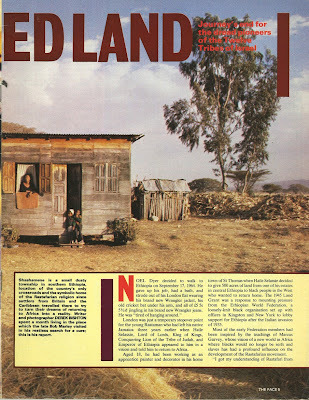 By the mid 1970s there were only about 15 Rastafarians living in Shashamene, but they were then joined by a second wave associated with the Twelve Tribes of Israel, the group that Bob Marley was associated with. 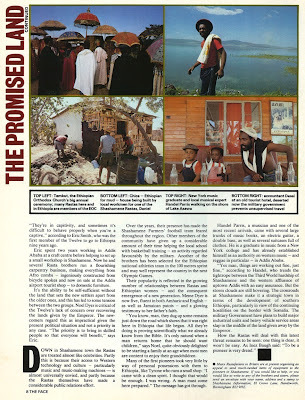 The article documents their lives and hopes, as well as their struggles in the face of poverty, political tensions, and internecine quarrels. Not sure how life is now in Shashamene, but the Rastafarian settlement is still in existence. Today is Hiroshima Day - on August 6th 1945, the first nuclear weapon was dropped on Japan, killing perhaps 70,000 people in an instant, and up to 250,000 people in total (many from radiation for years afterwards). Three days later, on Auugst 9th, Nagasaki suffered a similar fate. 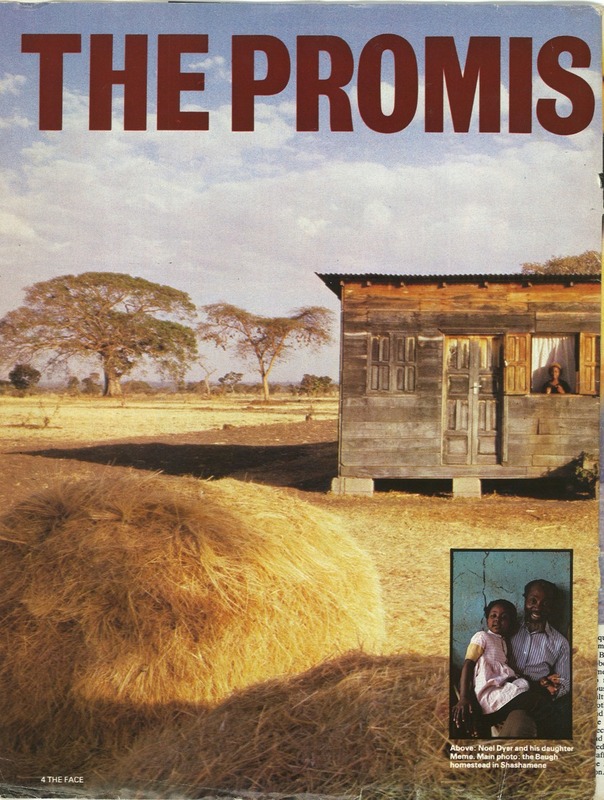 In music the fear of nuclear apocalypse was widely expressed - Tom Lehrer's We will all go together when we go, UB40's The Earth Dies Screaming, Peter Tosh's No Nuclear War, Hiroshima Nagasaki, Russian Roulette by Moving Hearts and many more. Post-Cold War the prospect of an all encompassing global nuclear war leading to mutually assured destruction and the end of life on earth does seem more remote. But the continuing existence of nuclear weapons - and indeed their proliferation - means that there is a continuing possibility of some city, somewhere, sometime, suffering a similar fate to Hiroshima and Nagasaki. Lebanese musician Zeid Hamdan, from the band Zeid and the Wings, was arrested last week for allegedly defaming Lebanese President Michel Suleiman in his single 'General Suleiman'. The songs is actually over a year old, but seems to have recently come to the attention of the authorities. And so he was called to the police station at the Palace of Justice in Beirut and then detained. After a Facebook campaign he was released later the same day, but may still face prosecution. The lyrics go: 'General Suleiman, Peace be upon you, General Suleimen... Put your weapons down, put your weapons down, now it's time to leave your warlords behind'. (Suleiman was a general before becoming President). All with some reggae lite backing. With music playing its role in the overthrow of governments in Tunisia and elsewhere, states in the Middle East are clearly anxiously checking out what people are listening to.